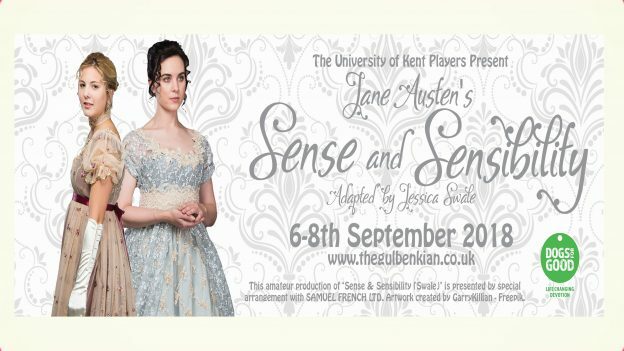 Following on from their very popular 2016 production of Pride & Prejudice, the University of Kent Players are proud to present Sense & Sensibility at the Gulbenkian Theatre from 6-8 September. The University of Kent Players is largely made up of current and former members of staff, so come along and support them in this lively production of a much-loved Jane Austen classic. A fun evening is guaranteed to be had by all! Tickets are on sale now either from the Gulbenkian box office. This entry was posted in Campus online, Medway Student, People, Student Guide and tagged Campus online, Canterbury, Medway, Student Guide on 31 July 2018 by Sophia Cheraitia.